This story text was copied from the text archives of the News and Observer. The story includes several statements from Kirstie Tice regarding her positive experiences with NDI and D'Amboise. 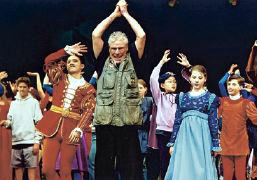 Jacques D'Amboise is looking for 100 enthusiastic kids for a dance workshop. Grace, rhythm and flexibility will get you far in a typical dance class. But legendary dancer Jacques D'Amboise won't insist on any of those things from the children he'll teach in a special workshop in Cary this summer. All he demands is enthusiasm. "I don't think I've ever worked with anyone that I couldn't get to dance and perform," says D'Amboise, 68, former principal dancer for the New York City Ballet and founder of the nonprofit National Dance Institute. "As long as they want to try, as long as they make the effort, they will achieve success." D'Amboise is hoping to gather 100 children 9 to 14 years old for a six-day workshop that will culminate in a performance at the Carolina Arts Festival on July 3 at Cary's Regency Park amphitheater. Children from throughout the Triangle will be selected at an audition March 29. The program is a collaboration by Carolina Arts Festival and Applause! Cary Youth Theatre. The audition and the workshop will be at the Herbert C. Young Community Center. The workshop costs $165 for Cary residents; $195 for others. Scholarships are available. Those selected will work with D'Amboise from June 28 to July 3. D'Amboise will collaborate with all the children on a new dance titled "First in Flight" to celebrate the centennial of the Wright brothers' first flight. Broadway star Terrence Mann, D'Amboise's son-in-law, will write and perform an accompanying song. About half of the youngsters will also perform in a piece D'Amboise choreographed called "Free Rides of the Planet," which is set to a poem by E.L. Doctorow and music by David Amran. The festival will also include a concert version of Mann's forthcoming musical adaptation of "Romeo and Juliet." D'Amboise founded his institute in 1976 to help engage and motivate children no matter what their aspirations. Each day, he says, about 2,000 children in mostly public schools in New York and Jersey City, N.J., take institute classes in dance, music history and related subjects as part of their regular school curriculum. The lessons culminate in an annual megaperformance called "The Event of the Year." NDI has affiliate programs in seven states. "We have no dropouts," D'Amboise said of the NDI classes, in a phone interview this week. "That's how seductive it is." Still, he adds, the workshop schedule will be demanding. "It's intensive," he says. "It's as if they were doing a Broadway show." Raleigh dance teacher Kirstie Tice can attest to the effectiveness of D'Amboise's approach. She studied teaching techniques through NDI and will assist D'Amboise at this summer's workshop. D'Amboise will also offer a workshop on teaching techniques while he's in Cary. Teachers of any subject, from dance to math, are invited. "He is very focused on each child," says Tice, who is assistant director [correction: Artistic Director] of the North Carolina Dance Institute. "Even though there is a room full of 100 people, he takes the time to point out each kid's success. Every child is important. Every child counts. And he won't give up. He will work and work and work until each child succeeds. It's superpositive." D'Amboise's approach may come as a welcome relief to dancers accustomed to the stern atmosphere of many dance classes, says Tice, who graduated from North Carolina School of the Arts. "Everything has to be so perfect. Perfect, perfect, perfect. Technique, technique, technique," she says, recalling her strict dance upbringing. With NDI, she says, "You don't have to be perfect. You just have to try, and have a great time doing it." Tice says her students are jazzed at the prospect of auditioning to work with such a famous dancer. But even if he weren't famous, she says, he'd still leave his mark. "I think studying with Jacques and getting to be in the same room with him leaves a lasting impression on the kids," she says. "They feel so special, and the energy he gives to them is a once-in-a-lifetime opportunity." What: Auditions for National Dance Institute workshop. When: March 29, 10 a.m.-4 p.m. Call for appointment. Where: Herbert C. Young Community Center, 404 Academy St., Cary.